What does a small producer of jeans have in common with a large manufacturer of jet engines, a green government building and one of the world’s most efficient water systems? They are all creating extra value with circular business models while simultaneously reducing negative environmental impacts. 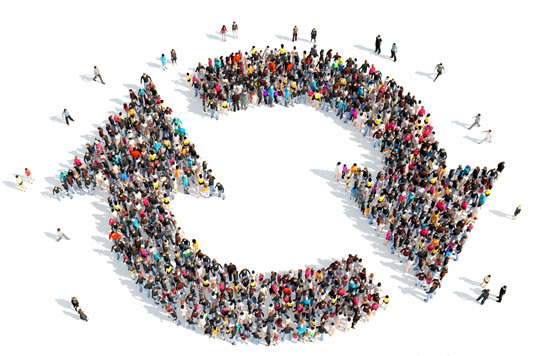 The CSCP coordinates the R2Pi Project – Transition from Linear 2 Circular, funded by the European Union, which aims to enable organisations and their value chains to transition to more sustainable business models. In February, the CSCP and R2Pi conducted several workshops in Brussels to help business leaders and policy makers rethink business models and co-create business tools and policy measures to implement sustainable and circular strategies. The workshops gathered stakeholders from multinational corporations, sector associations, policy makers and civil society. The R2Pi project presented lessons learned from the cases as well as explanations of various patterns of circular business models across different parts of the value chain (diagram below). The CSCP and R2Pi support policy makers and engage with stakeholders in creating policies that enable the circular transition, and the workshop went on to co-create policies measures in key sectors: food, electronics, plastics, textiles, constructions and water. 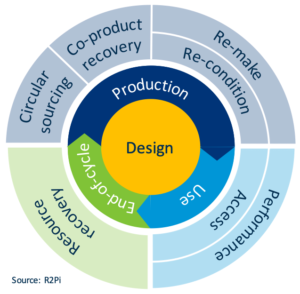 The compiled results of these and other engagements will be available later this year in the final results of the R2Pi Project in our Circular Economy Business Guidelines and Policy Packages. For further questions, please contact Raymond Slaughter.